The Philippine Journal of Public Administrationis a peer-reviewed journal that publishes research, reflections, and other scholarly work on public administration and governance within and outside the Philippines. The PJPA showcases developments, challenges and ways forward in the fields of policy and program administration, fiscal administration, voluntary sector management, leadership, ethics and accountability in public service, local governance, spatial administration, citizenship, democracy, organization and management, e-governance and networked governance, among others. The journal is published twice a year. The journal accepts submissions all year round. Interested contributors should adhere to the Journal Policies and Author Guidelines. For more information, please refer to the "About" page. 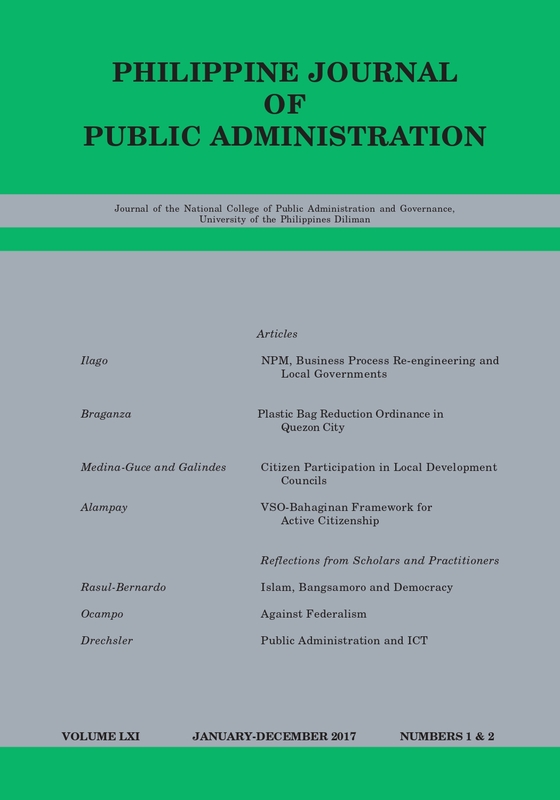 The Philippine Journal of Public Administration accepts manuscripts all year round. A Call for Papers is announced for issues of the Journal that deal with a specific theme or topic. Authors who wish to submit their manuscripts should do so via email at pjpa.editor@gmail.com. They can also hand-carry hard copies to the Publications Office, UP NCPAG (Tel: (02) 926-1443). Please refer to the "About" page for the manuscript formatting guidelines and other journal policies. We also suggest that you read the "Duties of the Authors" in the "Ethics Page" before you submit your manuscripts.